Home Soccer Marcelo: "If Madrid does not love me, they pay me and I leave"
Marcelo: "If Madrid does not love me, they pay me and I leave"
The side spoke in an interview for Esporte Interativo about his situation and about his future: "if the day comes when Real Madrid does not want me, I'm leaving, I'll be sad, but I'll leave." 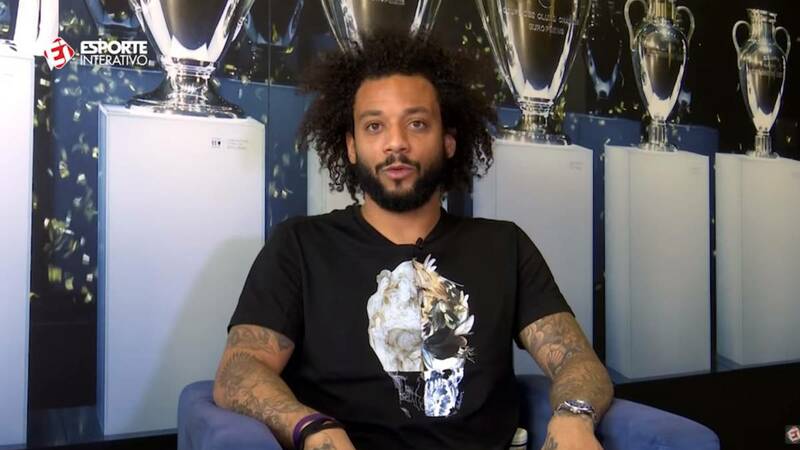 In an interview conducted by the Brazilian media, Esporte Interativo, the journalist Tatiana Mantovani chatted with the left-back of Real Madrid, Marcelo. In the advance of the interview offered by the media in social networks, you can see a video in which the football player confesses an anecdote related to the departure of Cristiano Ronaldo to Juventus. Marcelo: "Damn, we were training for the final and he told me: 'I'm leaving.'" Tatiana Mantovani: "Did he tell you before the final? . Marcelo: "Yes, I had to lie to you" . Apparently, the Brazilian player kept the secret to his partner even though the journalist had already asked him if the Portuguese had planned to leave before it was made public. Finally, it was not until the month of July when he changed Real Madrid for Juventus. Sobre if he is overweight he said: "I do not see it as news because it is a lie, I think they invent it to hurt a professional player. impossible to play with seven kilos more ". In addition, Marcelo was asked about Juve's alleged interest in signing him, to which the Brazilian responded by saying that it is "a spectacular club with a great history behind" but that "he has a contract with Real Madrid and I love being in Madrid". How is it: "I am happy, I have found my confidence again, I had a difficult period in my football and in the club but I always kept working and helping my teammates. physically well, I'm training hard, I need to play to regain confidence but physically I'm fine, this season unfortunately I have three injuries in two months, but that phase has already happened, I have to play to get back to my usual form and my confidence ". Reviews received: "I have no problem with criticism these twelve years because I know when I have to improve and what to do. So, they can say whatever they want, they can publish false news, it's football, but I'll always be with a smile on my face. I am not affected by what is said, but I have family and this season in normal games I have received enough criticism for things that any player can fail. The journalist can criticize, but I've been playing professionally for fifteen years. I am a professional "
Game style:" As I am a defensive player many people believe that I have to defend better, like Ramos or Varane, and that is impossible. I am lateral and I have to defend, but my strong point is the attack. You have to have a balance. " Suplencia:" I never felt ownership of the position, my motivation has always been to train and win the position. Every day I get up to train and play all the games. "I've been through worse times, even in the 2014 Champions League final. I was very angry because I wanted to play, I've been in the league five times but the coach is the one who decides." Solari: "Every coach has his idea With Solari the relationship is normal, it is very direct, he says what you have to do, he always thinks of helping Madrid, I know what my role is in Madrid and he has his own clear "
Zidane:" The departure of Zidane It was strange, it was a statement and most of us did not know it because everything was wonderful and it was a shock to me, we had a wonderful relationship, we talked every day, he was interested in me and I defended myself. It was very big for me, a professional, not only for the titles, he defended me a lot here inside and did everything for him, he ran, he fought, I played injured. Practically, I left my life for Zidane ". Possible outing:" If I am on the list of exits, that they pay me and everything is arranged. I trust in me, in my work, but if the day comes when Real Madrid does not want me, I'm leaving. I'll be sad, but I'll leave. But I'm sure I will not be fired. " Vinicius:" Vinicius does not stop laughing. I do not talk the whole game with him, but I talk a lot. I try to help in everything I can. He is very intelligent, with 18 years is knowing how to deal with all this pressure. "Now they have raised Vinicius very high and he has to be calm, I think he's doing well, he's calm.He will win many and lose many times. " Relation with the costumes:" He had a very good relationship with Cristiano. It is normal to be sad but with Casilla, who was sitting next to me, I have also felt empty, sad. I was with Kiko all day and now I have no one by my side. On the other side I have Bale, but he does not speak, he only speaks English. "